Switching off the lights in a room when going out is the most basic thing an individual can do to be more responsible toward the environment. But in a country hit with power cuts as severely as Nepal, the lights are usually “switched off” anyway. What matters more now is what alternatives we need to turn to in the absence of power. Unfortunately, diesel-run generators have become the first thing we turn to generate electricity. The total amount of electricity generated by diesel-run generators in Nepal is almost the same as that generated by hydro projects. The muffled hum (or loud sputtering if it’s an old one) of a diesel generator has almost become an anthem that begins to play within seconds of power cuts. Thoughts – and curses – drift toward Nepal Electricity Authority. Every time a new building goes up in the Valley, the power deficit only worsens. But every new building is also an opportunity to build in a new way. Buildings can be eco-friendly by design. Getting the people to build such houses is what the UN-HABITAT’s Green Homes project, funded by the EU, is trying to promote. The project’s goals are to encourage designs that protect occupants’ health, use resources effectively, and reduce waste, pollution and environmental degradation. It has come up with five criteria based on which a house is labeled ‘green.’ “We are talking about five elements, or pancha tatwa, as our ancient scriptures call them,” said Padma Sunder Joshi, Habitat Program Manager at UN-HABITAT, during a recent media briefing program. The project focuses on five major areas: green building, passive solar design, energy efficiency, water conservation and sustainable management of solid and liquid waste at household level. UN-HABITAT’s vision is that your dream home be a green home. The Green Homes project describes a ‘green home’ as homes that ‘emit fewer greenhouse gases, consume less energy, use less water, and offer occupants healthier environments than do typical buildings. 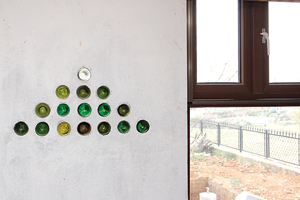 Green Homes use salvaged, recycled or low carbon materials. 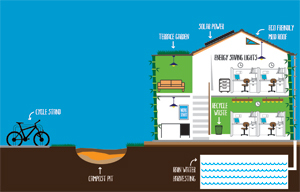 They support rainwater harvesting, solar heating, natural ventilation, and/or many other environmentally friendly practices.’ Due to limited space, perhaps not all the features can be incorporated into an office building, but it, too, can become more eco-friendly by adopting whatever criteria are feasible. “For many people economics is their philosophy. And maybe it works better from that aspect. You save money—it’s as simple as that. It all adds up at the end of the year when you make the final calculations. 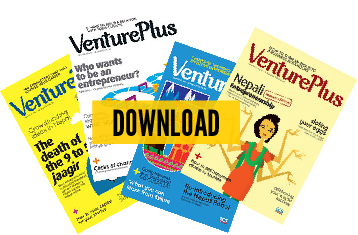 Even if you’re not philosophically inclined to sustainability, but are someone who manages the finances of a business, it is still in your interest to go green,” says Shrestha. One such decision is avoiding tinted glasses on windows, which makes your office more energy-efficient. The need to build more eco-friendly houses is not merely a matter of aesthetical choice or ideology. Kathmandu contains half of Nepal’s urban population. And it’s growing—exponentially. “By 2021 Nepal will need another million houses. To construct that many houses, we will need 55 billion bricks. Bricks are only going to get more expensive, money wise as well as ecologically,” said Joshi. No one is going to stop building homes. The stress now needs to be on building right. “Hollow concrete blocks are not only cheaper than normal bricks, they are also stronger,” said Santosh Shrestha, Sustainable Housing Analyst for the Green Homes project. “Concrete blocks provide better insulation. They also bond better and are thus stronger and more capable of withstanding earthquakes.” A house having features laid out by Green Homes also costs 25-30% less than houses made according to conventional design. 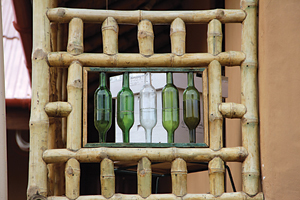 Adobe and Bamboo Research Institute (ABARI), a research, design, and construction firm, promotes adobe and bamboo as building materials. To build a house from earth or bamboo doesn’t sound reassuring. Add to that Kathmandu’s location in one of the most earthquake prone regions. But rammed earth is safe, if not safer than concrete structures. Evidences of the strength of rammed earth abound. Dr. Harry B. Humphrey (uncle of U.S. Vice President Hubert Humphrey) built a rammed earth house, designed by his wife and completed with the help of a carpenter and his two sons, in 1923. Dozens of hurricanes, heavy rainfall, and record-breaking blizzards later the house still stands today. 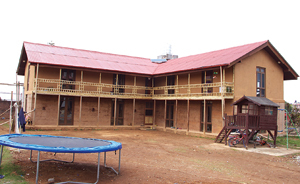 One of the first rammed earth buildings to be constructed in Kathmandu was Hemendra Bohra’s house in Budanilkantha. It is remarkable not just for what it’s made of but for how it is made. “We visited Bohara’s house in June. It was very hot outside, we were sweating profusely. But when we went inside it was so cool that we asked him if he had his air conditioner running,” remembers Padma Sunder Joshi. The air conditioner, of course, wasn’t on. The cool interior of the house was due to passive solar design, a design that seeks to get the best out of the changing position of the sun in the sky during winter and summer. 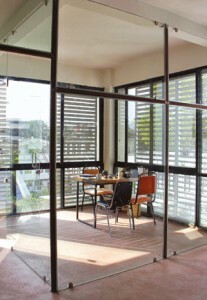 In winter, when the sun is low, the house’s design allows its rays to come in for a long time. When the sun is higher in the sky in summer, the protruding roofs cut out the sun rays, thus keeping the house cool. Narayan Acharya, a friend of Bohara’s, has also built such a house. “I built this house with three things in mind: the environment, health, and cost-effectiveness,” he explains. My research and Hemendra’s experience showed that building from rammed earth would meet all those features I wanted in a house.” The house is built on a stone foundation. Most of the mud came from the land on which the house is built. Of the total wood used in the house 80% came from demolished houses in Kathmandu. “We chose bamboo because harvesting bamboo does not affect the environment as adversely as cutting a tree does. Bamboo regenerates faster. 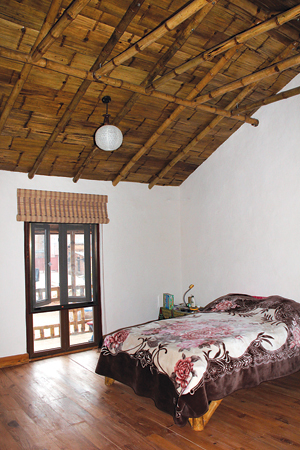 In addition, bamboo is also more resistant to earthquake,” he says. 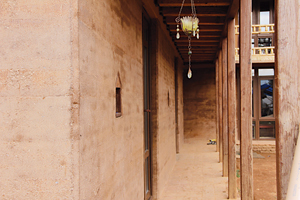 Acharya went against conventional wisdom when he made a double storied house of rammed earth. But he made the upper floor very light, using saw dust blocks to build the walls. Although he consulted numerous architects while building his house, he doesn’t claim that it is a hundred percent earthquake proof. “But at least we can sleep without fear at night,” he says with a smile. Smart Paani also specializes in water filtration. Kathmandu’s underground water is no longer as pure as it once was. But most buildings depend on pumped ground water. The BioSand Filtration is one of the most efficient systems of water treatment. It is one of Smart Paani’s best-selling services. It is also economically appealing. “BioSand filter does not need electricity, there is no need to add chemicals, and the maintenance is easy,” explains Sharma. He says that the filtration system can remove up to 97% of all harmful bacteria, and removes iron and reduces turbidity. And it’s about money. “Installing this system saves money on their electricity bill. It’s not expenditure; it’s more of an investment.” Many organizations and business houses have invested by installing these systems. Smart Paani’s client list includes Chaudhary Group, Jyoti Group, Dwarika’s Resort, Jagadamba Press, US Educational Foundation, Sajha Yatayat and Summit Hotel. There is another filtration system that Smart Paani is promoting. “Our rapid sand filter system can preserve harvested rainwater, which would otherwise go bad in a fortnight, for up to a year. You can use that water for anything, even drinking,” says Sharma. Saving water, Sharma says, is not only about being preserving the environment or saving money. It is also about convenience. “One of the results of rainwater harvesting and water filtration is that you don’t have to get up at night to collect water.” ABARI has come up with a bamboo water tank, which is almost 50 percent cheaper than plastic or concrete water tanks. Waste management is another area that needs attention. Like other aspects of a building, waste management offers plenty of benefits. Every individual living in Nepal’s cities produces an average of 250 grams of waste every day. Of this 60-70 per cent is bio-degradable. There are various systems of transforming this waste into compost. They range from very basic ones like bin composting and cardboard composting to vermicomposting, which is a process of making compost by feeding the waste to earthworms. “Imagine how much compost can be made if only all the coffee shops in Durbar Marg composted their used coffee grains every day,” says Shrestha. Bio-degradable waste can be a great source of energy for a building. The amount of bio-degradable waste produced daily by big restaurants and hotels is huge. With large amounts of such waste, there is the opportunity to produce biogas. Companies like Rapti Renewable Energy Service Pvt. Ltd. and Lord Buddha Nabikaraniya Urja Prabidhi Bikash provide services in construction of biogas plants. Due to lack of space, large biogas plants are not feasible in urban areas. For cities, Nepal Government’s Alternative Energy Promotion Centre (AEPC) provides technical assistance in installing floating drum biogas plant, which is a system of producing biogas in plastic tanks. The past decade or so has seen an unprecedented growth rate in Kathmandu’s population. Being environmentally sensitive and preserving our natural resources is no longer a matter of philosophy. It is something that affects us all. And although changes are needed at policy levels, the choices we make as individuals, families, and businesses is equally important. The importance of turning off the light when we walk out of rooms still remains. With a little more foresight, however, we can be sure that there will be power when we return to a room and switch on the lights. The three Rs – reduce, reuse, recycle – have been the cornerstones for an eco-friendly lifestyle ever since people began to take note of how they might be contributing to environmental degradation. Australia has been credited with introducing the fourth ‘R’ into the mix: Refuse. Here are a few ways you can make your workplace a little greener. Keep Plants: Besides aesthetics, plants help curb indoor air pollution and increase oxygen flow. Drink Responsibly: If coffee is the choice of beverage at your office, try and make sure it is organic. Change to steel coffee filters instead of paper ones and drink from a reusable mug rather than a disposable one. No to Paper: Paper is usually the most wasted item in an office. Save it whenever you can. Be reluctant to click the ‘print’ command. Share documents via email as opposed to making multiple printouts. Although the first priority always needs to be reducing, recycled paper is the next best thing. Recycled paper can be made by using less than half the amount of water needed to make new paper and it uses 60-70 percent less energy to make. using plastic or paper plates. No matter where you eat your lunch, use washable utensils. Right Stuff: You can’t do without stationery, but you can opt for environmentally friendly products like 100% recycled paper, refillable ink cartridges, non-toxic highlighters and markers. Right Light: Replace incandescent lights with CFL lights or, better, LED lights. LEDs give ten times more light than incandescent lights but use less energy. Turn Them Off: Turn of all electronic devices and lights whenever you leave your desk or room. Other Little Things: Paper clips instead of staples, black-and-white prints as opposed to color prints, and printing on both sides.